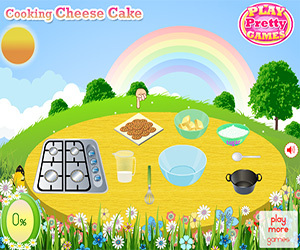 Cooking Cheesecake let you learn how to prepare a delicious cheese cake! Playing this game is a great way to learn the actions you have to take to get an amazing dessert! First, crumble the cookies, then turn on the cooker, place the pot on and add milk, butter and sugar in the pot. Now mix as fast as you can! After some moments take this mix to cover the crumbled cookies in a baking tray. Now turn on the oven to cook this delicious mixture! Now mix some flour, cheese and two eggs separately. Take this new mix to cover the previously cooked cookies and cook all this in the oven! After some time your wonderful cheesecake will be ready to be served to all your guests! Have you learned all this culinary secrets from this game? 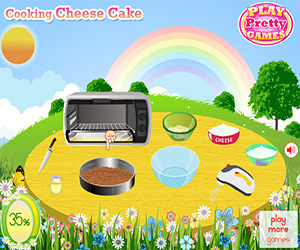 Follow the instructions and you will be able to cook an amazing Cheesecake. Play it now!